powered by Assistly) in the customer service space. We've all been deeply involved in this space since 1996, when we were part of the early team at eShare Technologies, one of the very first companies to develop solutions for call centers to deal with customers on the web. Things have changed significantly since the days of eShare. It used to be that you had to build a product and have it run within a company's data center. This generally meant that the software company had to waste cycles in developing and testing for different server operating systems and various database platforms and versions. I remember even having to work within a client's datacenter to discover and fix our software for different database drivers - that we didn't know had existed. Even after the decision was made to buy our software, there was a long IT process required to install and configure. 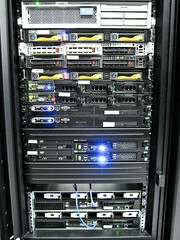 Servers had to be ordered, procured, racked, wired, etc.
. In addition to the typical definition, Dr. Vogols indicated that to be truly recognized as cloud computing, the operation should be completely on demand and it needs to be pay as you go. This is exactly the same guiding principle that we plan to pass onto our customers. There is no need to by a perpetual license for 100 agents to manage a one month peak if normal volumes call for only 20 agents - just scale up and pay for the additional 80 agents for the one month that you're using them - and then immediately scale down your usage. In addition to having a different overall philosophy with how products should be marketed and sold, it's my belief that we have a distinct advantage in building for the scale, resilience, availability, etc. of the cloud. I don't think that building for the cloud precludes us from going on prem at some point - or for allowing our customers to extend their data centers with something like Amazon VPC - but I think our product will simply be better as it's designed with the proper architecture right from the start.